Projects undertaken include soft and hard paste porcelain, stoneware, low fired ceramics, glass, enamels, jade and ivory. Beky is a member of the Institute of Conservation (ICON) and is the editor/committee member for ICON’s Ceramics and Glass Group (CGG). The Beky Davies studio is based in South Somerset, it is close to the M5 and A303 and is equal distance from Exeter and Bristol. 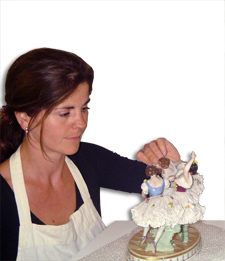 At the studio we can restore or conserve Soft and hard paste porcelain, Bone China, Stoneware, Earthenware, Terracotta and other low fired ceramics, Pottery, Enamels, Glass, Ivory, Marble, Jade and Parian ware. If you would like a broken ceramic object restored, repaired or conserved we can give you an estimate. Please feel free to email or post us photographs of your objects with an explanatory covering letter. You can contact us via email or phone. If you wish to post objects please contact the studio first.